It likely comes as no surprise that finding a job after a stint in prison is no easy prospect. If you’ve filled out a job application in the past 10 years or so, you’ve likely seen the question most of us don’t give a second thought: “Have you ever been convicted of a criminal offense?” For those who have to check “yes,” though, the question can be a significant barrier between them and a job that allows them to provide for themselves. In some cases, the foodservice industry is creating a path for those who are trying to turn their lives around. Serving Time Café is located in Draper, Utah, just outside of Salt Lake City. The café looks like any other restaurant, with a counter to order and pay at, a few tables available in the small interior space, and a porch seating area. The first clue that this restaurant is different is the prices: The plates are all very cheap, with only couple items priced at more than $5. Once you put together the location of a prison next door and the cheeky crime-and-punishment-themed food names on the menu, what makes this restaurant so special becomes more obvious. The café serves a unique and valuable purpose – in addition to feeding locals, it provides a job training resource for inmates at the nearby women’s prison. The restaurant was the brainchild of correctional supervisor Carolyn Price, who now manages the restaurant. Prior to the restaurant, there were few work opportunities for incarcerated women, in contrast to the multiple options available to men, such as construction and meat processing. Women from the Utah State Prison have to undergo rigorous screening before they are allowed to work at the restaurant, but the basis for selection takes their in-prison record into account more than what infractions they are actually in for. The restaurant has positions for nine women, but there’s a high turnover rate because most of the workers chosen are on their way out of the system. However, for the women who get to take part in the program, the experience is invaluable. 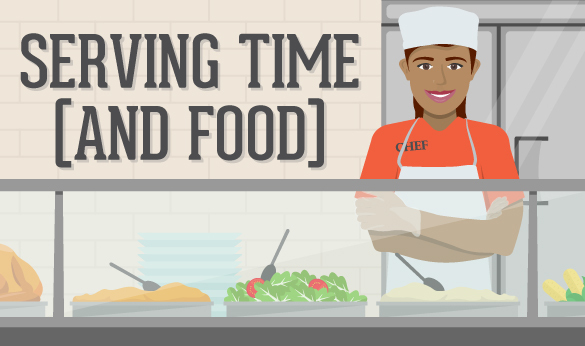 In addition to job training for working in foodservice, the women who work at Serving Time make between $1.40 and $1.75 per hour, helping them save up for the necessities they’ll need when they are released. Working in the café also helps inmates get used to interacting with the public, something many of the women have not had to do for years. Between bolstering their social confidence and their real-world work experience, the hope is that the women who work at the café will have an easier time transitioning into society and finding work when they are released. While Serving Time is the only foodservice program in the United States that allows inmates to serve the public while still incarcerated, the foodservice industry in general is no stranger to employing former inmates, who often face barriers to employment even years after release. A survey by the Ella Baker Center for Human Rights found that almost two-thirds of inmates surveyed were unemployed or underemployed five years after they left incarceration. That unemployment has been shown to be a factor in pushing some former inmates back to lives of crime, contributing to America’s notoriously high recidivism rate. To help address this problem, Brandon Chrostowski founded the EDWINS Leadership & Restaurant Institute, a program that trains past offenders in hospitality and culinary arts. The program was inspired by Chrostowski’s own brush with the law at a young age. He got a lucky break that led to a successful foodservice career, but he realized how difficult it was for others to overcome their rap sheets. The culinary institute does whatever is necessary to help its students succeed. The program is 6 months long, during which the institute provides living quarters, a small stipend, clothing, job coaching, medical care, and legal counsel. Even transportation and childcare assistance are available, and once the students graduate the institute, they either work in the EDWINS restaurant or are aided in finding employment elsewhere. In stark contrast to the national rates, students who go through the EDWINS institute have a 95 percent employment rate after graduation and, as of June 2016, a zero percent recidivism rate. In addition to the institute, Chrostowski works with the Grafton Prison in Ohio to provide culinary job training for inmates, teaching skills that equip them to find employment in the foodservice industry once they are released. The institute’s training programs will be expanding again soon, with a butcher shop expected to open in 2018. Courtney Barkley has lived in nearly as many southeastern states as most Americans have probably visited, settling in East Tennessee in early 2013. She and her husband Thomas were married during ShadoCon 2012 – an anime, gaming, and comics convention – in a ceremony that featured a reading about dinosaurs in love from a friend dressed as Doctor Who. She spends her free time chasing her brilliant and imaginative son Nathan, hanging out with friends, binge-watching shows, playing video games, and keeping up with the characters of the Marvel Universe. And, any chance she gets, she sneaks off to Florida to visit friends and the happiest place on earth – Disney World.